UNBIASED NEWS? via ASSOCIATED PRESS? BELOW IS THE LEAD PHOTO RELEASED BY THE ASSOCIATED PRESS illustrating the activity around the capital on the morning of the vote to either confirm or reject Brett Kavanagh as a Judge on the highest court of the land. 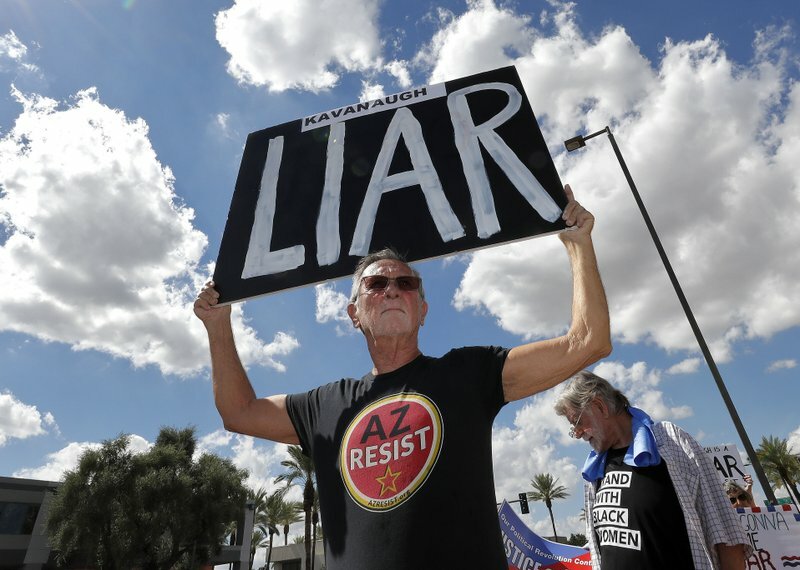 I know I am supposed to believe that there is no bias in the mainstream media, but when you lead the article with a huge sign that says “Kavanagh Liar” one gets the message…. And we ain’t talkin’ “Dog Whistle” here….. nothing unclear as to the left leanings of the Associated Press. Drudge didn’t help matters much, generously gifting, with, the charming , albeit chubby bathroom wisdom…………. “The rage of the left!” with ” WALL URINAL” Amy Schumer, raising a fist of defiance at the camera. Imparting open and riotous rage Overall, the short article describes the mornings activities with no blathering histrionics and an interesting description of each sides attitudes and activities. This entry was posted in History and tagged Kavanaugh confirmation, media bias by jackhammerjohn. Bookmark the permalink.